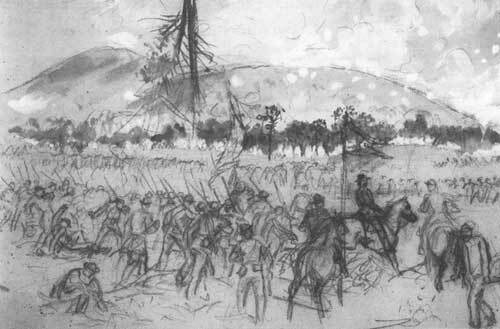 As the main attack of the XV Corps moved forward, one of the most savage actions of the fight on the north end of the Kennesaw line occurred in the diversion assault launched by the Army of the Tennessee. In Walker’s front their approach was hidden from view by a dense forest growth except on the extreme right adjoining French, where the pits running across an open field, were held by Co. C, of our regiment. This company retired with French’s pickets, leaving a vacancy in the line. The Oglethorpes were in reserve, and Maj. Allen, misled by Capt. Buckner as to the situation and ignorant of the fact that the attacking column had already reached our skirmish line, ordered the company into fill the gap. Gallantly led by Lieutenant Blanchard and McLaughlin, they advanced at a double quick step and on reaching the open field were met by a murderous fire both from the front and flank, for French’s deserted pits were already occupied by the enemy. The woods to the left and front were swarming with blue coats. On a portion of the line held by Co. K they had reached the pits and a hand to hand conflict ensued. Men fought with clubbed muskets . . . . They had picked up something too hot to hold. Attacked both in front and flank by largely superior numbers they were in veritable hornet’s nest. They fought bravely to hold their position, but the odds were too great and George McLaughlin, seeing that it was wholesale death or capture, sang out, “Save yourselves, boys!” The place was too hot to hold and almost to let go. For two or three hundred yards to the rear was an open field sloping upwards. To retire through this bullet swept as it was at short range, was simply to court death. Obliquely to the rear was a piece of woodland from which some protection could be gained. Most of the men made a break for this. Some of them ran squarely into the arms of the enemy who had possession of the woods, and were captured. Some failed to leave the pits in time and were taken prisoners there, Some ran the gauntlet safely, while some brought to the rear in frame or limp a perpetual souvenir of that warm day. This entry was posted in Battles, Campaigns, Common Soldier, Western Theater and tagged 63rd Georgia, Atlanta Campaign, Kennesaw Line, Kennesaw Mountain, Morgan Smith, Pigeon HIll, Walter Clark. Bookmark the permalink.